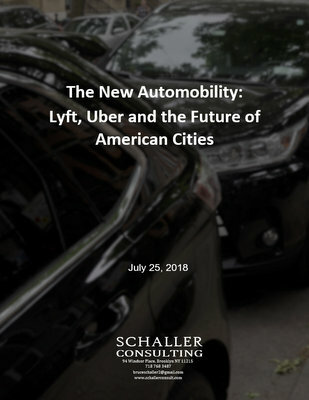 The report then discusses how TNC and microtransit services can benefit urban transportation, how policy makers can respond to traffic and transit impacts, and the implications of current experience for planning and implementation of shared autonomous vehicles in major American cities. TNCs transported 2.61 billion passengers in 2017, a 37 percent increase from 1.90 billion in 2016. Combined TNC and taxi ridership is likely to surpass local bus ridership in the U.S. by the end of this year, making them among the largest urban transportation providers. TNCs account for 90 percent of TNC/taxi trips in eight of these nine large metro areas (New York is the exception), but taxis serve slightly more passengers than TNCs in suburban and rural areas. TNC customers are predominantly affluent, well-educated and skew younger. Shared ride services such as UberPOOL, Uber Express POOL and Lyft Shared Rides, while touted as reducing traffic, in fact add mileage to city streets. Even with these shared services, TNCs put 2.6 new TNC vehicle miles on the road for each mile of personal driving removed, for an overall 160 percent increase in driving on city streets. Shared rides add to traffic because most users switch from non-auto modes. In addition, there is added mileage between trips as drivers wait for the next dispatch and then drive to a pick-up location. Finally, in even a shared ride, some of the trip involves just one passenger (e.g., between the first and second pick-up). Trip fees, congestion pricing, bus lanes and traffic signal timing can help cities manage current congestion generated by increasing TNC trip volumes combined with other demands on limited street space. If additional steps are needed to reduce traffic congestion, policy makers should look toward a more far-reaching goal: less traffic. Key steps involve limiting low-occupancy vehicles, increasing passenger occupancy of TNCs and taxis, changing commercial vehicle operations, and ensuring frequent and reliable bus and rail service. Without public policy intervention, the likelihood is that the autonomous future mirrors today’s reality: more automobility, more traffic, less transit, and less equity and environmental sustainability. Policy-makers should steer AV development away from this future starting today with steps to manage TNCs and personal autos and emphasize frequent, reliable and comfortable high-capacity transit service.